For many young Afghan expats - especially women - the relative peace and progress of the past one decade evoked hopes of a better future at home. But now the fear of losing the hardly earned gains is worrying many. Afghan women in an exclusive talk with fairplanet. Mana Saadat, a young Afghan women right activist who spent most of her life in Iran, came back to Afghanistan some eight years ago with high hopes. But what she has been witnessing in the capital Kabul-generally considered safest place in the country-was far away from her expectations. A part from the usual gender based harassment; she nearly got killed in a suicide attack while witnessing a theater drama inside the French Cultural Center in the heart of the capital on December 11, 2014. A latest Amnesty International report has blamed both the Afghan government and the international community for turning their back on the Afghan women rights activists. The report titled, Their Lives On The Line states that women human rights defenders in Afghanistan who face mounting violence - including threats, sexual assault and assassinations- are being abandoned despite the significant gains they have fought to achieve. Their Lives On The Line documents how champions for the rights of women and girls, including doctors, teachers, lawyers, police and journalists as well as activists have been targeted not just by the Taliban but by warlords and government officials as well. Laws meant to support them are poorly implemented, if at all, while the international community is doing far too little to ease their plight, it adds. Salil Shetty, Amnesty International’s Secretary General, told a crowded press conference in Kabul that women human rights defenders from all walks of life have fought bravely for some significant gains over the past 14 years – many have even paid with their lives. It’s outrageous that Afghan authorities are leaving them to fend for themselves. “Women human rights defenders from all walks of life have fought bravely for some significant gains over the past 14 years – many have even paid with their lives. It’s outrageous that Afghan authorities are leaving them to fend for themselves. , with their situation more dangerous than ever,” Shetty said. Based on interviews with more than 50 women defenders and their family members across the country, Amnesty International found a consistent pattern of authorities ignoring or refusing to take seriously threats against women. Just last month, an angry mob killed a 27 years old girl at the bank of Kabul Rive on a bright day in a manner that shocked the world. Farkhunda was falsely charged for burning a copy of Quran before being beaten to death and then set on fire. A nationwide outburst of anger, agony and despair followed the death of Farkhunda in Afghanistan. But for young activists like Mana Saadat, even such a horrific act of violence against women would just become part of history with no or little lasting impacts on the persisting mindset of violence and oppression against the weak and vulnerable. “I do not think those who killed Farkhunda and those who were watching it happen publically and did not bother to help her will change their mind, they might just do it again and again”, she feared. In an exclusive interview with fairplanet, she said the bigger tragedy of the country was the fact that there are many who praised Farkhunda’s killers in the first place. In the eyes of Shukerya Jalazai, the Director of Afghan Women Coordination and Promotion Organization, however, a positive change can only come from within the society. Urging upon the need to streamline an Afghan-led women rights movement, Jalalzai argues by not considering the local values, some moves have hurt the movement rather than going any good to it. “Some short sighted and donor-driven projects have given birth to more doubts than enlightening the society about women”, she said. As Afghanistan heads for a new era of self-reliance following the withdrawal of most of the foreign troops, securing the lives of women and girls and promising them a prosperous future is nothing less than a matter of dignity in the civilized world yet a daunting task for the whole nation. 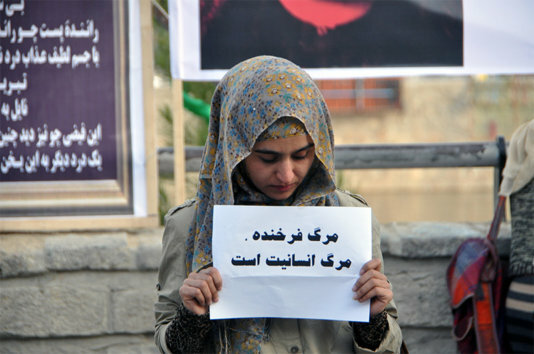 A girl carrying a card that says: "The death of Farkhunda was the death of humanity". 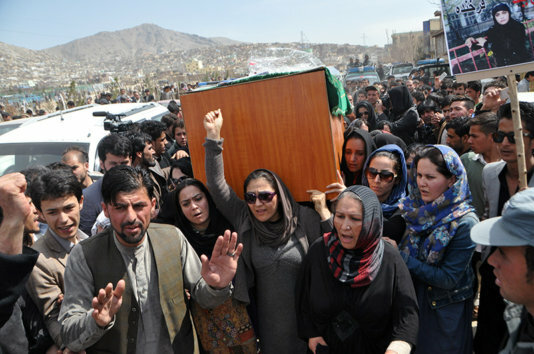 Women carrying the coffin of Farkhunda to the graveyard.